I have finished February's commitment in the "Traditional nine patch swap" held by Trish....yay! I am happy with the colours, and loving the Metropolitan Fair range! 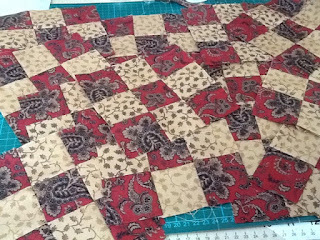 Next on my list is Natalie Birds Red home bag for Chookyblues SAL... only 8 days to finish ouch! Love them Deb......very happy to know that one is coming to my house! I love the combination of that shade of red with that latte/beige fabric. They look lovely. If it wasn't for the last minute...nothing would get done!...Thats my motto...working on my SAL and 9 patch now! !...love your blocks. You just can't beat a good old nine patch. Love your fabric choices.